September Pulls! 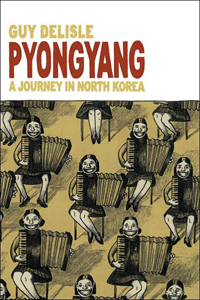 From the 19th Century to the Outer Reaches of the Galaxy to the Hidden Fortress that is North Korea. 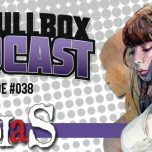 We’re back with another round of graphic novels to discuss for The Pullbox Podcast! You can choose to read any or all of these books to be a part of this podcast. Just head to your local library, book store, comic shop, Comixology, or find a friend with a copy that you can borrow, and start reading! Once you’ve finished reading, send us an email with your thoughts! Did you like the book? Why? What are your thoughts on the writing? The art? The characters? The premise? 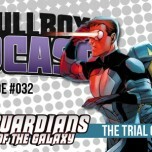 We’ll read one or two emails for each book on the Podcast; one of those emails could be yours! We will always lean toward the more thought-provoking emails that will allow us to carry on the conversation. The episode will be released on October 1. By Brian Michael Bendis, Steve McNiven, and Sara Pichelli. There’s a new rule in the galaxy: No one touches Earth! No one! But why has Earth suddenly become the most important planet in the galaxy? That’s what the Guardians of the Galaxy are going to find out! Join Star-Lord, Gamora, Drax, Rocket Raccoon, Groot and – wait for it – the invincible Iron Man, as they embark upon one of the most explosive and eye-opening chapters of Marvel NOW! These galactic Avengers are going to discover secrets that will rattle Marvel readers for years to come! But while London deals with a brutal invasion by the Badoon, the fate of the Guardians may have already been decided millions of miles away! Why wait for the movie? It all starts here! Available in hardcover (ISBN: 978-1896597898) and paperback (ISBN: 978-1897299210) from Drawn and Quarterly. Available in paperback as (ISBN: 978-1596438132) from First Second and digitally at www.delilahdirk.com. Reader Pull suggested by Doug Ferguson. 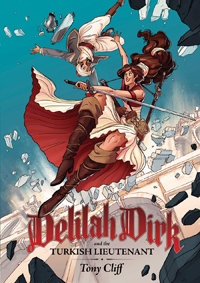 Lovable ne’er-do-well Delilah Dirk is an Indiana Jones for the 19th century. She has traveled to Japan, Indonesia, France, and even the New World. Using the skills she’s picked up on the way, Delilah’s adventures continue as she plots to rob a rich and corrupt Sultan in Constantinople. With the aid of her flying boat and her newfound friend, Selim, she evades the Sultan’s guards, leaves angry pirates in the dust, and fights her way through the countryside. For Delilah, one adventure leads to the next in this thrilling and funny installment in her exciting life. After receiving a copy of Web of Spider-Man #60 at his 10th birthday party, Kurtis has had a lifelong passion for comics. In 2011 he published his first book, CHUCK JONES: THE DREAM THAT NEVER WAS (IDW/Library of American Comics), featuring CRAWFORD, the unknown comic strip from the legendary Looney Tunes director. 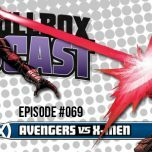 He is also the creator/cartoonist of KIDS, EH?, a daily comic strip about the real life funny things his kids say and do and co-host of the PULLBOX PODCAST, an international graphic novel book club podcast. Kurtis' taste in comics include everything from classic comic strips (Terry and the Pirates, Polly and Her Pals) to kid's comics (Zita the Space Girl, Ghostopolis) to Franco-Belgian bande dessinée (Freddy Lombard, Monsieur Jean). 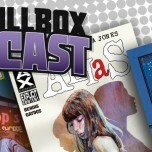 April Pullls: Alias, Archie, and Anthropomorphic Animals!